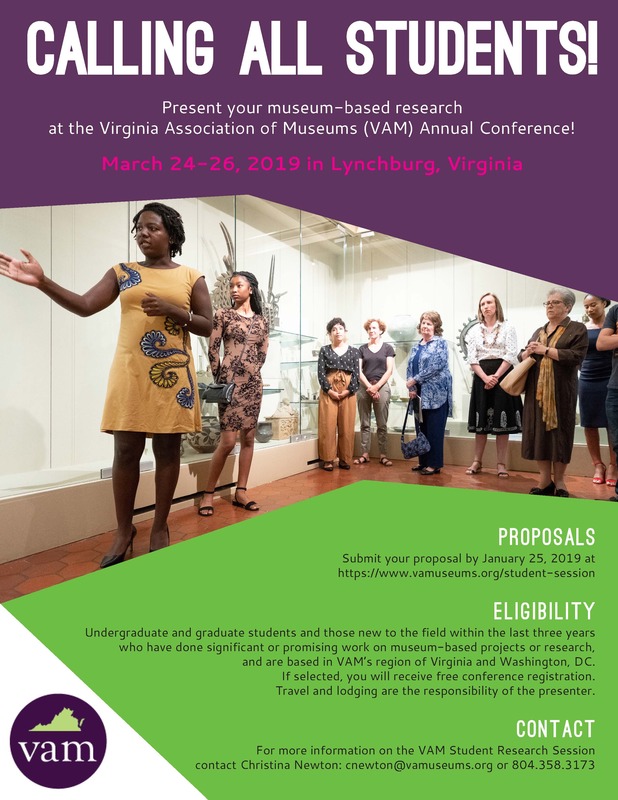 Undergraduate and Graduate students as well as those new to the museum field (within the last three years) are invited to apply to participate in VAM's Student Session during the 2019 Annual Conference. The student research session showcases three jury-selected presentations on the latest museum-based student projects and research, as well as offer a way for students to connect with experienced museum professionals and other students to gain new insight, share ideas, and network. Those selected will receive a scholarship to attend VAM's 2019 Annual Conference taking place in Lynchburg, Virginia. The session will take place on Sunday, March 24, 2019. The Virginia Association of Museums (VAM) recognizes the future of the museum profession is in the hands of current college and university students. Representing the fields of art, history, public history, science, education, museum studies, historic preservation, archives and more, students are already engaged in the classroom and as museum interns, doing research, producing exhibitions, developing education programs, recording oral histories, and creating web content, among other work related to museums and nonprofits in Virginia and the District of Columbia. We hope this opportunity will help further our student members' careers and offer stronger connections for emerging professionals. Undergraduate and graduate students and those new to the field within the last three years who have done significant or promising work on museum-based projects or research, and are based in VAM's region of Virginia and Washington, DC. If you're a fulltime student and not a member of VAM, join today for FREE! A working group of the Annual Conference Program Committee will serve as jury to select three presentations based on individual merit and relevance. Those selected will have approximately 15-20 minutes to present on their project that was developed for a museum or class. The presentation should be organized in much the same way as a paper: title, introduction, body of work, conclusion. The presentation will be timed and will be followed by a 5 minute question and answer period. Selected presenters will be awarded a scholarship to cover conference registration; all travel and lodging expenses will be the responsibility of the presenters. The 2019 Student Session will take place on Sunday, March 24, 2019 during the conference to be held in Lynchburg, Virginia. Exact time and location tba. For questions, please contact Christina Newton at cnewton@vamuseums.org or 804.358.3170.